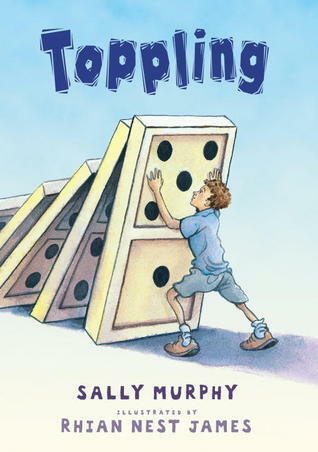 In this novel in blank verse, fifth grader John loves to create elaborate constructions of dominoes and push them over. He would much rather do that than go to school, but he does have a good group of friends, and he likes his teacher, Miss Timms. After his friend Dominic throws up at school one day, John expects him to be out for a couple of days, but no one expects that he has a tumor that has to be removed because of cancer. This causes the entire class to be concerned, especially John's group of friends. They do what they can to help Dominic, sending cards and visiting. The class is doing independent research projects, and John is very surprised when Ky, the class bully, does his project on cancer. In the end, the boys come up with a way to show their support of Dominic as he continues to fight his disease. Strengths: I can't think of many books that show the effect that cancer has on a school classroom. This would certainly be a good book to read aloud at the elementary level. Weaknesses: Both this book and Pearl Verses the World are very young. The language is very simple and the illustrations, while good, make these a tough sell for middle school students, even though John is in fifth grade. I have no idea how elementary students feel about novels in verse, but the combination of length, pictures and verse makes this one I won't buy. This is too bad, because the topic is an important one. I've had a couple elementary girls who like novels in verse - but they want "funny" or cheerful ones. The only novels in verse I've ever had boys read (elementary or teen) are Sharon Creech's Love that Dog and Hate that Cat. I think quite a few of the kids who read these don't even realize they're in verse. They just think they're really short books.